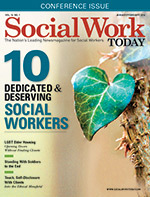 In the first issue of each year we honor 10 professionals who have been nominated by their colleagues and selected by Social Work Today as Dedicated and Deserving Social Workers. They are interviewed by one of our writers about their career paths and as I review those interviews, I usually find some quality that emerges as a common theme. This year it seems that almost all of the honorees found that there was only one path that met their career needs, and that was social work. Gary Bailey, DHL, MSW, ACSW, a professor of practice at Simmons College Graduate School of Social Work and the Simmons School of Nursing and Health Sciences in Boston was a case in point. Once he learned about the field of social work, he said he simply knew, "That's me. That's who I am." Olivia Lopez, PhD, LMSW, an adjunct professor of social work at Del Mar College in Corpus Christi, TX, and a social work immigration consultant, says the stories she heard from immigrants about their homeland were so awful that "even Quentin Tarantino couldn't make a movie that horrific." "The ideal for the future is closing down these detention centers and opening residential communities where immigrants can get some actual peace and some effective clinical work," Lopez says. "The litigation is still happening. This isn't something that changes overnight. Social workers really are the first line. And we can make a difference." Paul Milford, MSW, RCSWI, a social work consultant at Children's Medical Services in Fort Myers, FL, was part of a high school shadowing program and was matched with a social worker who worked with very young children. Milford says that even as a young person, he knew it was what he was meant to do. He fell in love with the profession right then and there. Russell Vergara, MSW, MA, an adjunct lecturer at the University of Southern California School of Social Work, started out on a career path toward medicine, but says that as a social worker, he feels he has become a "well-rounded playmaker." Vergara says, "Medicine would not have allowed me to help in the way I wanted to. It's social work that is the tailor-made profession of solving problems. It's incredibly fulfilling."